Get cozy at OMCA this winter with our new Acoustic Space Series featuring performing arts experiences each month inside the galleries now through mid-March. Live music outdoors will resume every Friday starting on March 23 with the launch of our Summer Season of Friday Nights @ OMCA. Tonight, join us in the Gallery of California Natural Sciences to experience Urban Folk and World music by Haji Basim in celebration of Black History Month. 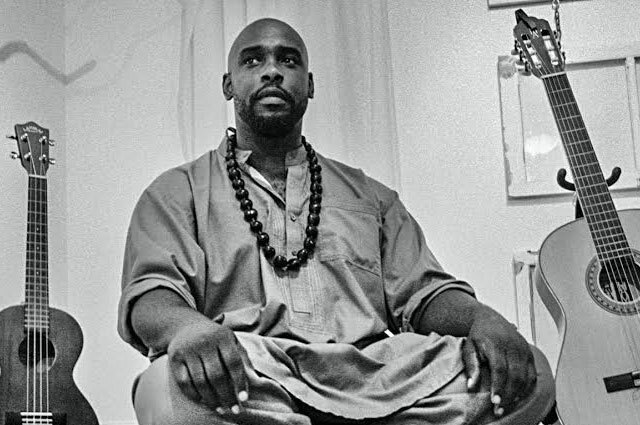 Haji Basim is an award-winning artist, multi-instrumentalist, yoga expert, and urban folk crooner who has performed at musical festivals all over the world. This multi-talented singer-songwriter plays the guitar, banjo, ukulele, and sitar (to name a few), and created his upbeat, signature genre of Urban Folk Music. Get inspired by the uplifting melodies and thought-provoking lyrics of Haji’s unique blend of blend of Folk, Devotional, and World music while you take in the Gallery of California Natural Sciences. Don’t miss Take Root: Oakland Grows Food during your visit, and be sure to catch the final weeks of the powerful video installation Question Bridge: Black Males in the Gallery of California Art. View the Friday Nights @ OMCA schedule for February 16.